Water consumers all assume that their water supply is safe to drink and use, but contaminated drinking water can be dangerous to the health and well-being of your family. Water supply systems are maintained at a specific pressure that allows us to keep water flowing from faucets, shower heads,and toilets. 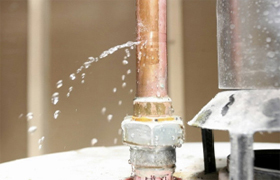 If a water pipe freezes, bursts or leaks, there is the chance that the pressure in the system can be reduced, and as a result, contaminated water from other sources can enter the system. This can be water from the ground or from other areas where water is stored. Backflow is an unwanted flow of water in a reverse direction. This can mean potable water is getting into sewage lines, or waste water is getting into drinking water lines. Backflow is something that needs to be addressed as quickly as possible to ensure water is safe, and healthy for consumption and use in your home. To prevent this from happening, backflow prevention devices need to be installed and in place. These devices prevent drinking water from becoming contaminated. But like parts of a car, they wear out over time, which is why it is critically important to have your backflow prevention devices tested regularly. Our certified backflow testing device experts can make sure that all your backflow devices are working and safe. The quality of your water is too important to leave to chance. Please call or contact us today to set up a site evaluation.